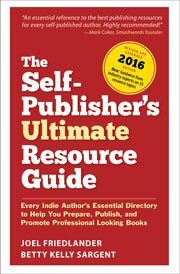 I round up articles on self-publishing related topics that I think you’ll find helpful and interesting, and publish this post almost every Sunday. I try to select a variety of subjects, but is there something specific that you’re interested in? Something you would like to know more about when it comes to self-publishing your book? If so, let me know in the comments. And, don’t forget that you can find past posts here on The Book Designer by category on the Articles page or by month by accessing our Archives found at the bottom of our homepage. So You Think Social Media Won’t Sell Your Books? A new study of US book prices shows that book genres with more female authors are also cheaper. For their analysis, researchers from Queens College in New York looked at 2 million individual titles published in North America between 2002 and 2012. Books identified as having a female-named author cost 45% less on average than male-named. The researchers compared trends in traditional publishing with self-publishing, where authors choose their own genres and set their own prices. They found the same pattern, though the gap was narrower. “With greater freedom, workers in the gig economy may be inclined to greater equality, but will largely replicate existing labor market segmentation and the lower valuation of female-typical work and of female workers,” the researchers wrote.